The Australian International Airshow 2017 at Avalon Airport once again provided a wonderful opportunity for members of the Australian Air League to get up close to a broad range of aircraft both old and new. 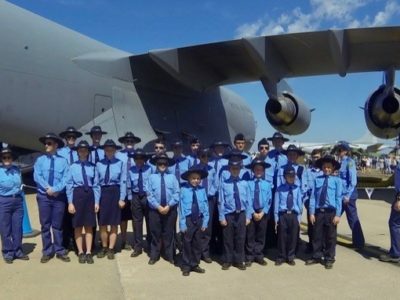 Over 50 cadets from Queensland, NSW, SA and across Victoria were provided the opportunity to see an amazing array of aircraft and systems both on the ground and in the air. Not only were they amazed and inspired through nearly 8 hours of air displays by over 60 aircraft, they were also given opportunities to also get ‘inside the barriers’ with some of the participants. The wonderful people of both the Temora Aviation Museum and the Historic Aircraft Restoration Society gave our cadets special access to their aircraft as they provided exclusive guided tours throughout the weekend and answered a range of questions about their aircraft. 36 Squadron, Royal Australian Air Force also gave our members a special treat with a special tour of their C-17 Globemaster III strategic transport jet. Many questions were answered by the pilot and loadmaster as this cargo hauling behemoth filled with AAL cadets. And finally, in a sign of wonderful trans-Pacific relations, the United States Air Force also provided the cadets with special one-of-a-kind access to their F-22 Raptor Air Superiority fighter. On both public days, ‘Brawler’, a pilot from the 90th Fighter Squadron based in Alaska, gave a 20-minute briefing and Q&A session to our inquisitive cadets who were also ‘inside the perimeter’. Parents, friends and passers-by could only look on in envy the cadets gained a rather unique insight into what it’s like to fly the most expensive and advanced air superiority fighter in the world. And far in the background, a number of AAL members were also doing their bit in providing information to quite a number of interested parents and kids. By the airshow’s conclusion, over 50 people had registered their interest to learn more about the AAL, and how their children may become part of this amazing organisation. Sam, Vanessa and the crew from 36 Squadron RAAF, for their tour of the C-17 Globmaster III and Q&A sessions with the cadets. From the 90th Fighter Squadron, United States Air Force, Brawler, TSGT Deschamps, Droop and Lee, for their work in getting us so close to their F-22 Raptor. Maureen and the crew of Historic Aircraft Restoration Society’s Connie, for their tour of the aircraft and wonderful support. Andy and the team from Temora Aviation Museum, for the tours of a number of their aircraft throughout the Air Show. Tristar Aviation, for their kind donation of a 1 hour joy flight.